I recently purchased and finished reading fellow runner, regular Ultra Tales contributor an avid blogger James Adams book “Running and Stuff”. 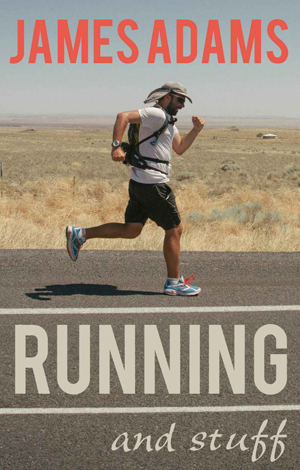 In this book James tells is about his introduction to long distance running from his early running to his first Ultra Marathon event (The Tring 2 Town). We then follow his exploits over the next few years as he undertakes bigger, longer and more difficult (except the Marathon Des Sables perhaps!) challenges. Each chapter dedicated to a different race and I really enjoyed visualising the environment and atmosphere of each event as he describes his own experiences in tackling each of these races. The book eventually culminates in the re-telling of his epic LANY (Los Angeles to New York) 3,200 mile run over the summer of 2011. Those people who follow James’s blog (of the same name as the book link here) will be familiar with his open, honest and humorous style of writing. Nothing is glossed over as he recounts the physical pain and emotional turmoil he experiences during some of those low moments along with recounting those occasional moments of satisfaction. James has completed some incredible challenges and yet is quite humble about his achievements. As one (of many) people in the UK ultra running community who has met and run with James I think the book is true to form in describing his character and personality. He does not strike you as an extrovert or a larger than life character but does possess an inner confidence and determination to see a challenge through to the end. Once that is done, he reflects on his thoughts and then expresses himself through his blog and now his book. His race reports, stories and anecdotes were easy to relate to, witty, highly entertaining and I found myself leaping from chapter to chapter in a rush to finish the book. Anyone who has an interest in long distance running or anyone who wants to hear a true to life account of an ordinary guys experiences undertaking some amazing challenges should pick up this book, it’s a fabulously entertaining read. The great news is that is just the first part of James’s story with many more challenges, adventures and experiences ahead of him and I look forward to reading the follow up to this book in a few years time. The book is available to purchase in kindle format here (I understand the possibility of releasing a paperback option is being considered).